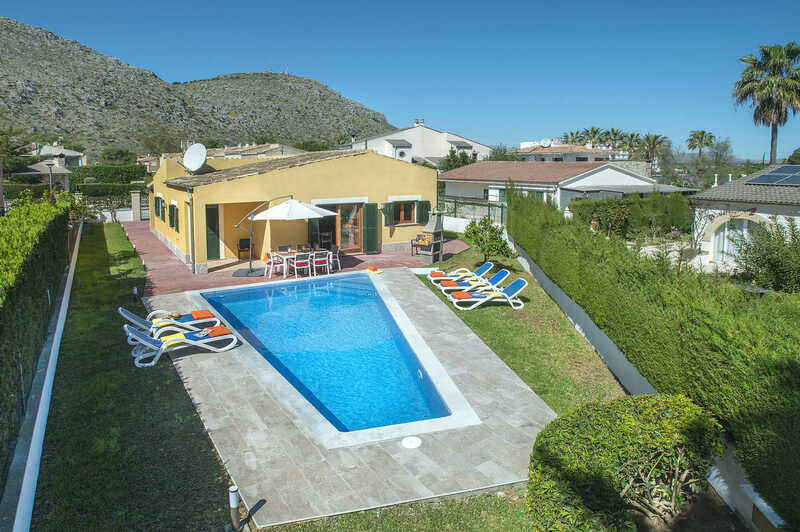 This delightful 3 bedroom villa is right in the heart of Alcudia. It's only 5 minutes' walk from Bellevue - the main street - which has a huge choice of shops and restaurants leading up to the superb sandy beach. Plus, the marina and old town are easily reached by taxi or local bus. Villa Champions (formerly known as Villa Campeones) has a unique private swimming pool with views of the mountains behind the house. Air conditioning/heating in the bedrooms and WiFi are included. The fantastic central position, right in the heart of Alcudia. The shops, restaurants and beach are all within a short walk - perfect! Villa Champions has a unique triangular shaped swimming pool, surrounded by ample space to sunbathe, with views of the mountains behind the villa. The dining area and BBQ are by the poolside and the terrace extends around to the front of the house where there is a pool table and table tennis table, as well as a pleasant covered seating area. The front terrace is gated from the street, with the main entrance by the seating area. The open plan lounge and dining area has comfortable seating, a flat screen TV and a table and chairs. It has several authentic touches including the tiled floor and a traditional beamed ceiling. The adjacent kitchen is well-equipped, and has a small breakfast table with patio doors onto the pool terrace. At the far end of the kitchen is the laundry room, also with access to the garden. Villa Champions has 3 bedrooms. The double bedroom has an en suite bathroom whilst the twin and single bedrooms share a separate shower room. All 3 bedrooms are well-furnished, fresh and comfortable with plenty of storage space. Villa Champions is perfectly positioned, only a couple of minutes' walk from the centre of Alcudia. You'll be spoilt for choice with places to eat and shop along the main street, leading all the way to Alcudia's beautiful sandy beach. Plus, a couple of minutes in the other direction is the lake which is home to Majorca's only wakeboarding centre! The resorts' marina and old town can be easily reached by car or bus and are well worth seeing, plus Alcudia also has a fantastic sea-facing golf course. Villa Massanet is next door. The centre of Alcudia is right on your doorstep, and has several gift and beachwear shops as well as more chic designer boutiques. The old town is 2 miles away and can be easily reached either by car, taxi or local bus. The town has a number of quaint shops as well as a lively market every Tuesday and Sunday morning selling everything from clothes and jewellery to fresh food and souvenirs. The centre of Alcudia - also known as Bellevue, or Cuidad Blanca - has a huge choice of restaurants, bars and cafes, with varied menus to satisfy your entire party. By contrast, Alcudia Old Town is filled with traditional Spanish restaurants whilst the marina has several fine dining establishments overlooking the yachts. Undoubtedly one of the main attractions of Alcudia is the glorious 5 mile long sandy beach. A couple of alternative smaller but equally picturesque beaches, including Mal Pas and Playa de Muro, can be reached within a short drive. This popular resort has several family attractions. The Hidropark is around 20 minutes away on foot, or 5 minutes by car. Alcudia also has a popular go-karting track and horse riding facilities. Alcudia Old Town is certainly worth seeing during your stay. From the outside, the town resembles a castle, with parts dating back to around 1300. You can even walk along the top of the wall and enjoy the view over the area. For anyone who does decide to hire a car, Pollensa (Pollenca) Old Town and the lively seaside resort of Puerto Pollensa (Puerto Pollenca) are not far away. Further afield you can visit Europe's largest underground lake at the caves of Drach, or venture to Palma - Majorca's only city! Golf Alcanada is around 20 minutes' drive away, on the far side of the marina. There's also a good country golf course in Pollensa. You'll find several water sport facilities at Alcudia Beach. The nearby lake also has a wakeboarding centre. Or you can visit the local S'Albufera Nature Park which is popular with walkers, hikers and bird-watchers. Villa Champions is not available to book for season as it is sold out. Take a look here at the Majorca villas that are currently on sale. The villa is in a great location, near to everything and all within walking distance. The villa itself is very spacious and has everything you could need. Great villa, great location - really loved the villa!